Kids today are charging harder, jumping further, and soaring higher than ever before. More and more ski resorts are scrambling to offer lift-served bike parks during the summer months. This increase in both accessibility and skill level is causing bike manufacturers everywhere to scramble to make capable downhill mountain bikes in smaller sizes. 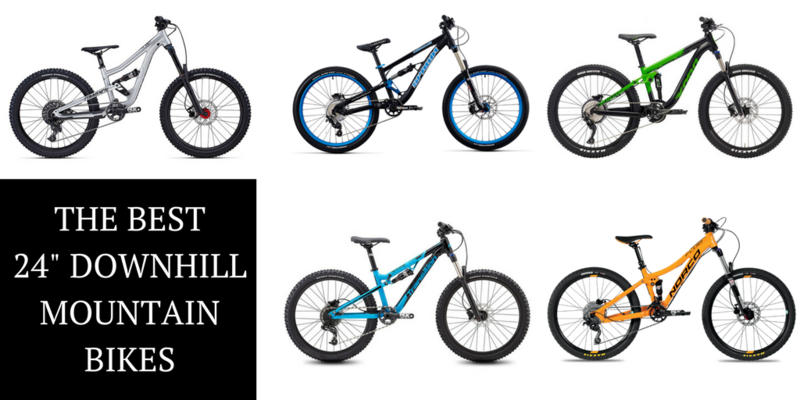 Here are the best 24″ downhill mountain bikes available. Some of these are purpose-built DH rigs, others are more trail-oriented full-suspension bikes that are capable of serving at the bike park as well. From budget to anxiety-inducing price-tags, we’ve rounded up them all. 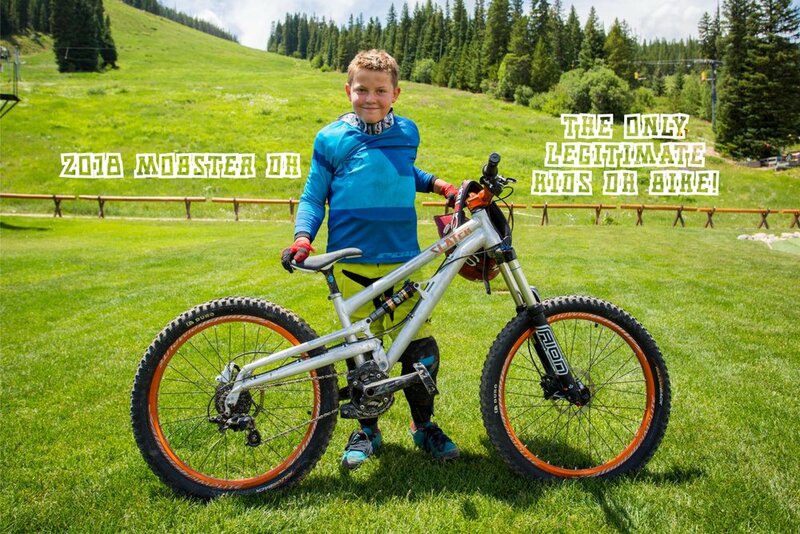 Lil Shredder is a mountain bike company specifically for kids — which means their bikes aren’t an afterthought to bigger, more grown up bikes. 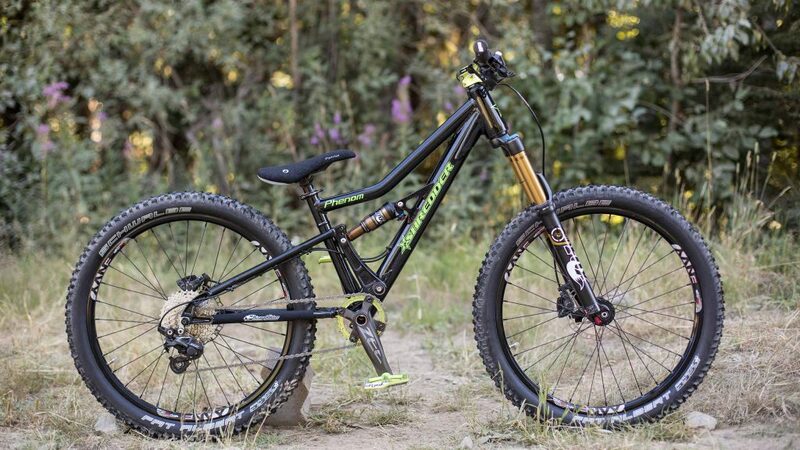 The Lil Shredder Phenom is their 24″ DH/Trail offering. The frame is handcrafted in the USA and can be built up with your choice of components. The Meekboyz bikes are about as nice as you can get. The 24″ Mega Beast is feather light for a full-squish bike (26.5 lbs), particularly when you consider it comes with a whopping 180mm of travel. 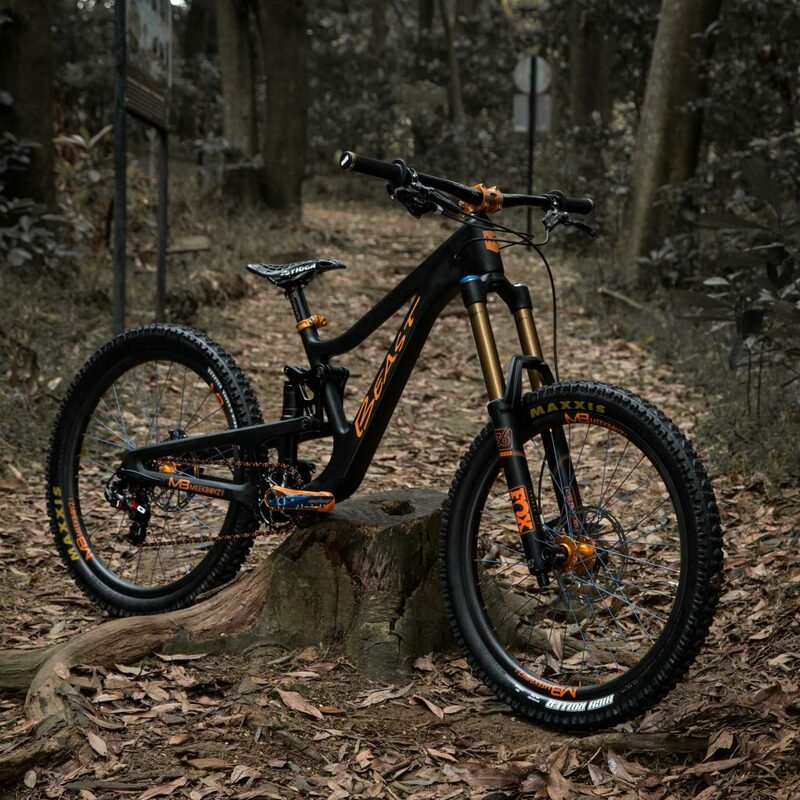 Meekboyz manages this impressive feat by using a full-carbon frame and top-shelf components. Of course, you pay for what you get. In this case, a gulp-worthy $7,500. Commencal knows how to do youth mountain bikes the right way, paying special attention to appropriate geometry for kids and teenagers. The Commencal Supreme 24 offers 150 mm of Rockshox travel via a Pike and Monarch rear shock–huge travel for a kids body size. The bike has nice component specs and the ability to really rip! If you are up for the challenge of building up a rad downhill bike, consider the Slater Mobster. They sell the bike as a frame and shock only. This is a true downhill frame, offering 150mm of travel and super slack geometry. Like Kona, the Fluid FS 4.2 is more trail oriented but offers plenty of travel to serve dual purpose as a park bike a few days out of the year. The bike boasts 100 mm Rockshox A.R.T. suspension design, Maxxis 2.0 Snyper tires, and a mixed bag of components –Shimano drivetrain, Novatec hubs, Alex rims, Tektro brakes, and in-house Norco components. It comes with a JD TransX dropper post, which we haven’t seen on many of the other bikes. 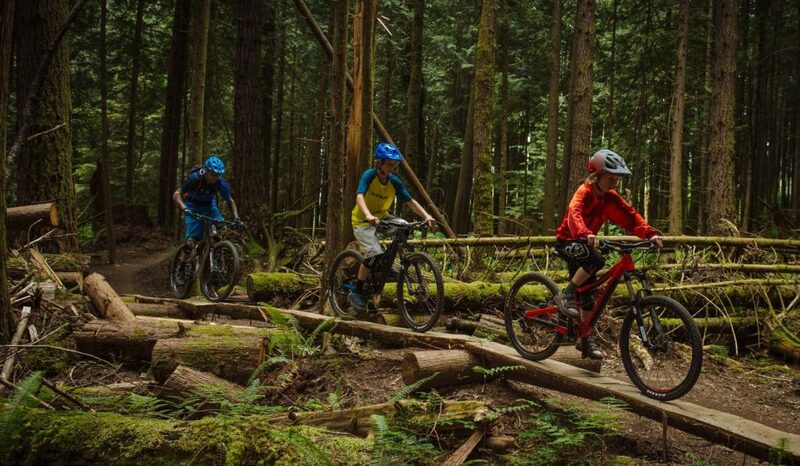 From 12″ to 24″ bikes, Spawn offers some of the nicest mountain bikes available for kids. The Spawn Rokkusuta 24 is a highly-capable full-suspension steed. It uses a Horst Link suspension design and O2 Pro RLX rear shock. Other components include X-Fusion Velvet fork, SRAM Guide Brakes, and SRAM GX drivetrain. The bike comes stock with Kenda Small Bock Eight tires (2.1). At this size and for downhill riding, I think kids need a beefier tire. Spawn offers the Brood Maxtion 2.3, a much beefier tire that’s well worth the upgrade. The Transition Ripcord is a good all-around 24″ bike for kids. It is light enough for cross-country duty but burly enough to handle downhill runs for little ones. The 67 degree head angle and 381mm chainstays make a stable, but poppy bike. The component build is a mix of SRAM, Shimano, and WTB. 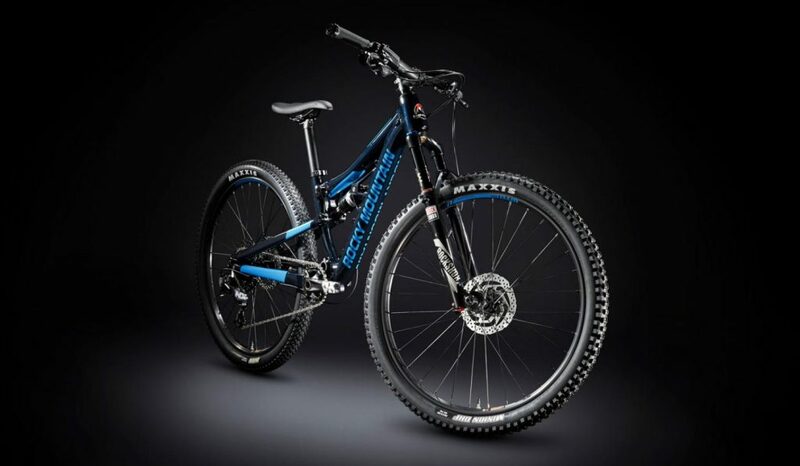 Other parts include lightweight 100mm front and rear Rockshox travel, Kenda Kinetic 2.35 tires, and Jalco wheels. This thing has all the right components, smart geometry design, and offers cross country, trail, and downhill duties for parents who don’t want to spend a fortune on multiple bikes. 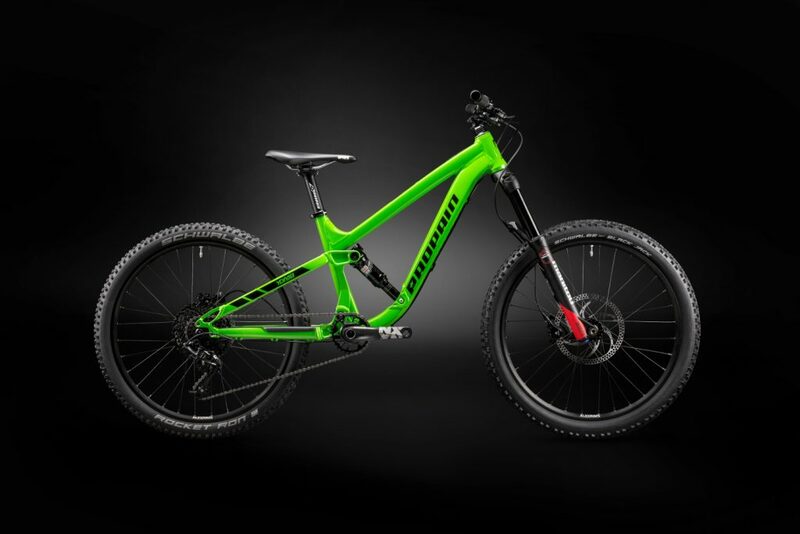 The Rocky Mountain Reaper is touted as a trail bike, but is capable of the occasional day at the bike park thanks to the beefy suspension design (120/130 mm travel front and rear respectively). adjustable geo chip and quality component spec. Usually, a bike has more front travel than rear if not equally matched, but with the Reaper Rocky Mountain designed in a little extra in the rear so it can be run very plush — up to 50% sag. This bike can also grow with your child. The Ride 9 chip design allows it to transition from 24″ wheels to 26″ wheels once your little ripper hits their next growth spurt. You might have a bit of trouble figuring out how to import the Propain Yuma into the United States, but we’ve heard it can be done. The bike can convert to a 26″ bike as well, making it worth the hassle. The Yuma boasts 140 mm travel, Sram GX drivetrain, and Schwalbe Rocket Ron tires. A little on the small side, as far as travel is concerned, but the Mondraker Factor 24 is nice bike that could handle some downhill riding. We’ll admit it–trying to choose between all these bikes is tough. So many good choices! Use the comparison chart below to help sort by price, weight, etc, so that you can make the right decision for your child and pocketbook. Scroll right to see all columns. 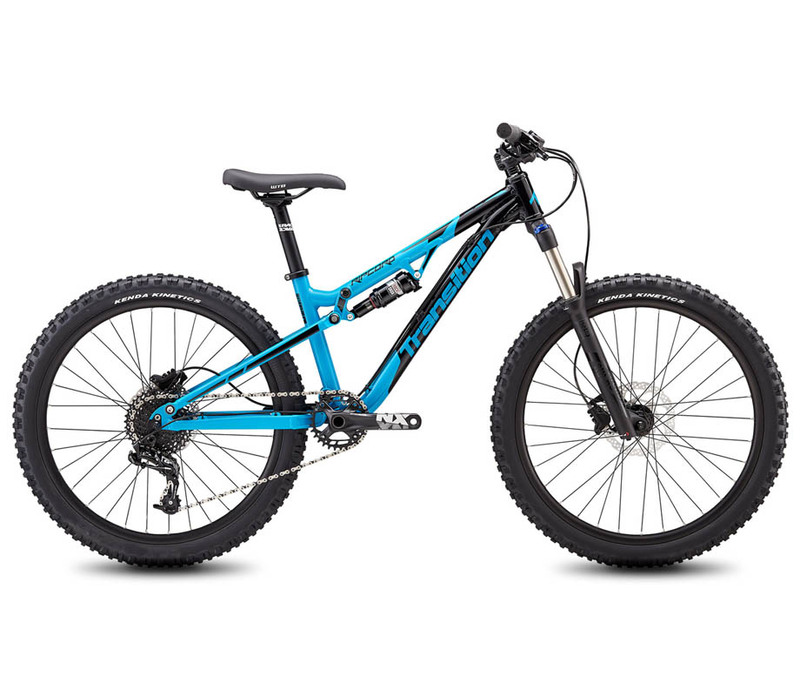 Most 24″ mountain bikes are appropriate for kids in the 8 to 11 year old age range. Of course, this is widely variable depending on the size of the child, and the geometry of the specific bike you are looking at. The best thing to do is to measure your child’s inseam and compare it to both the stand over height of the mountain bike you are considering and the minimum seat height. Of course, it is also awesome to be able to demo a bike before buying it to make sure it fits and is comfortable for your child. Unfortunately, it is harder to find demos and local dealers for kids bikes than it is for adult bikes. We’ve divided all the bikes listed here into two categories: either “downhill slack” or “DH and Trail” (see comparison chart above). 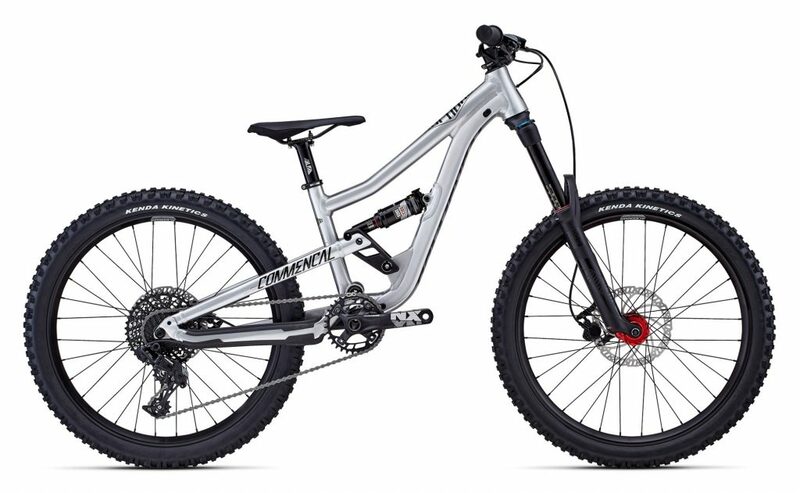 The Downhill Slack bikes are true downhill mountain bikes that are intended only for lift-serve and shuttle riding. Unfortunately, there are only a few true downhill bikes offered with 24″ wheels, and they come with a pretty hefty pricetag. That said, the cost is worth it if you have a child who is serious about downhill riding. 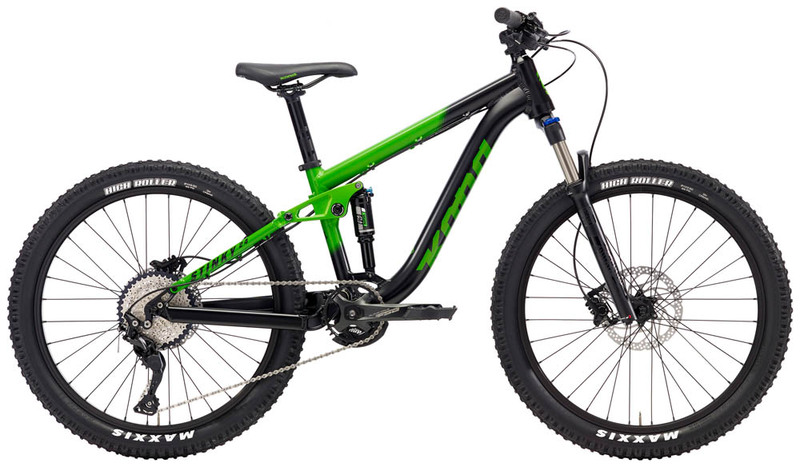 The “DH and Trail” bikes that we have listed are capable of both downhill and trail riding. This is ideal for most families who will do both trail riding as well as lift-served bike park type riding. 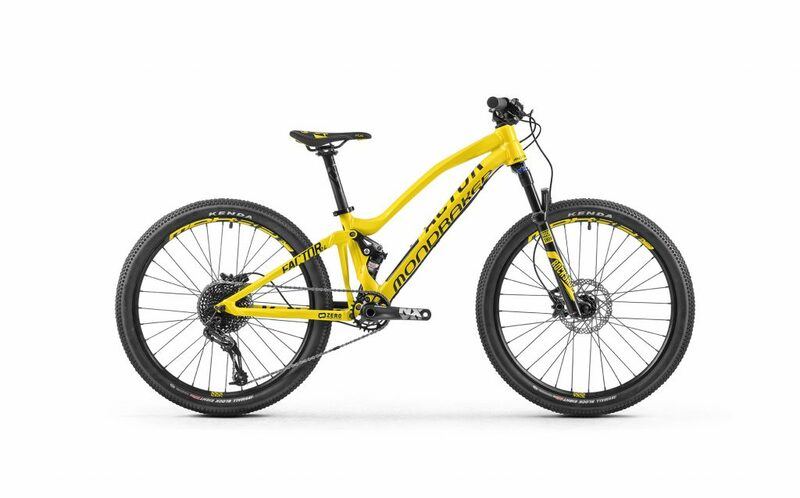 These bikes also have the added benefit of being a bit more affordable, and saving you the expense of multiple mountain bikes if you plan on doing riding in both disciplines. 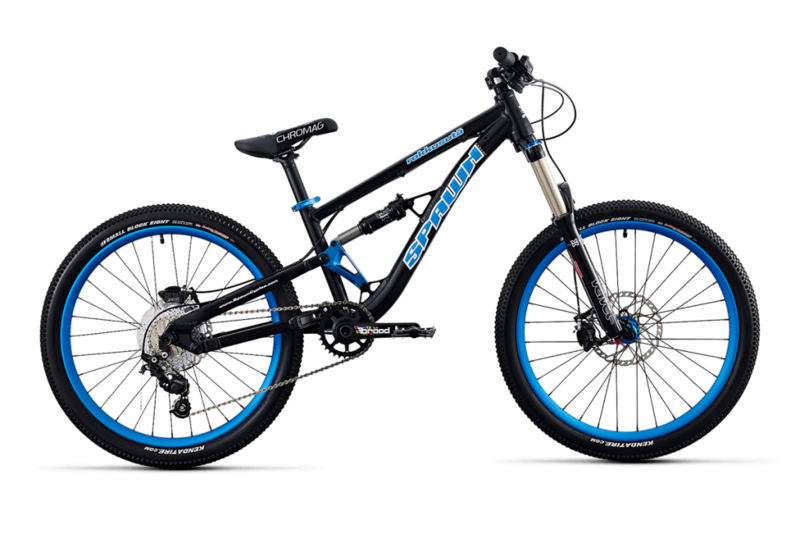 The more suspension a mountain bike has the better suited it is going to be for true downhill mountain biking. Also, the more aggressive your child is, the more important bigger suspension is going to become. 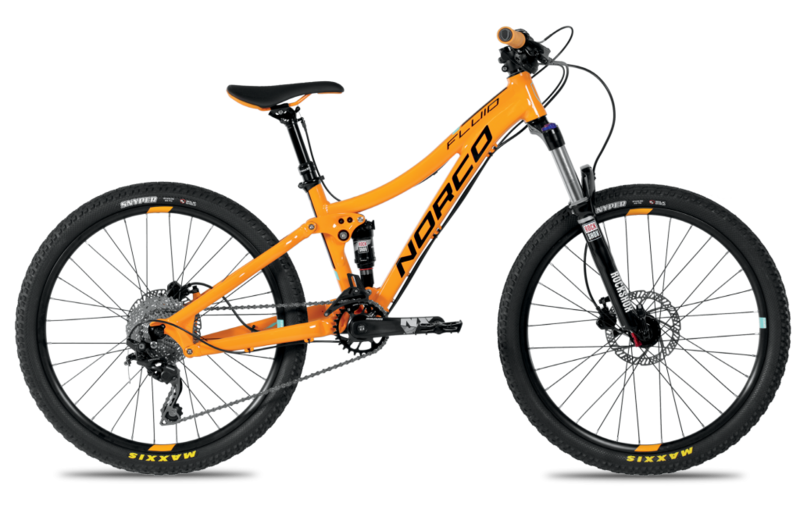 If you plan on using this bike primarily for bike park and shuttle riding, we recommend looking for a mountain bike with AT LEAST 140mm of travel. There are a couple of these on our list above. If you plan on doing a bunch of trail riding, with some downhill days thrown in, you might be able to get by with a little less. In general (but not always), the less travel there is, the lighter the overall build is. The weight of a downhill mountain bike is far less important than the weight of a cross-country mountain bike. That said, you shouldn’t discount weight all together. Kids at this age still do not have the upper-body strength and dexterity of an adult. Give a kid a bike that is too heavy and they will have trouble maneuvering and jumping the bike. They will also get tired sooner. Buy the lightest bike with the most travel that you can afford. Great post, thanks for the feedback. I’ll be heading to Utah in about a week, any family day trails (just passing through) you recommend in Salt Lake area? We love Trailside Bike Park and the Round Valley trails in Park City. Fun for all ages. The Draper Bike Park and corner canyon trails in Draper are family faves as well. You can find them all on Trailforks. Hope you have fun and let me know if you have any questions.